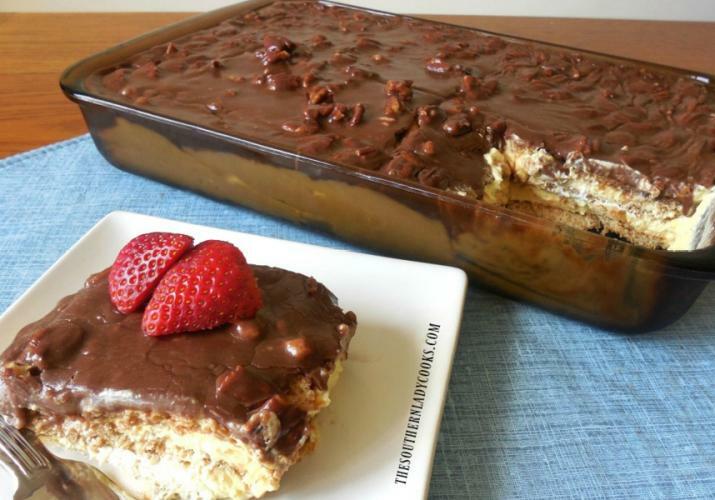 This Chocolate Éclair Cake is a classic. It has been around for a while but is a wonderful cake to take to church events, picnics, family gatherings or anywhere people get together. This is more like a pudding than a cake and you probably won’t bring any home. A great dessert anytime and one your family and friends will love. This is better if you put it in the fridge for 24 hours before serving. You could cut the recipe in half. It keeps well for several days in the refrigerator. We love it with fresh strawberries! Place a layer of graham crackers in the bottom of a 9 x 13 inch baking dish. Mix the pudding with the milk and Cool Whip and spread half of it over the graham crackers. Place another layer of graham crackers over the pudding and the rest of the pudding over the second layer of crackers. Add one last layer of graham crackers on top. Bring butter, cocoa and milk to a boil in a saucepan on top of the stove. Remove and stir in sugar, vanilla extract and nuts, if desired. Spread over cake.